I make a lot of lists as a food blogger. Currently my “up next” list, where I index the next few recipes I’d like to make, has 53 ideas on it. That should keep me busy for a while on its own, but it grows every day as I think of something new or see something I want to adapt. If only I was a full time food blogger…*daydreams*. The list is getting so long that I actually implemented a color coded system to determine the order in which I plan to make each recipe. The great thing about this is that I really love making lists. The funny thing is that I rarely stick to them. For instance, French Dip Wonton Cupcakes did not appear on my list until a couple days ago when I saw French Dip sliders on a menu. My cravings tend to supersede any and all organizational systems I put in place, so as you can see, these were bumped up 53 spots, straight to the top. These “cupcakes” definitely satisfied my French Dip craving. Piles of thinly sliced roast beef, smothered in Au Jus gravy and cheese and nestled in a perfect little wonton cup? Yes, please! The other great thing about this recipe is that it takes almost no time to put together, so it’s a great idea for weeknights when you don’t really feel like cooking. In a microwavable bowl, combine the roast beef, cheese wedges and Au Jus sauce. Microwave for 2 minutes on high. Stir to combine until cheese wedges are melted and roast beef mixture is fully coated with cheese and Au Jus sauce. I just found your blog and I am so glad I did! I am always looking for quick, easy, and healthy recipes! I have been on WW P+ since March and I am thrilled that you included the P+ value in the recipe!!! I will surely try these very soon! These look AMAZING!! I love french dips…. cant wait to try these! Made these for dinner tonight! They were soo good!!! I have to figure out how to get the whole wonton crispy for next time. Bake the wontons for a few mins before filling them. Delicious – tasted just like a french dip! This was the recipe that finally convinced me to buy wonton wrappers and start cooking my way through your cupcake recipes, and it definitely did not disappoint. Thanks!! OMG those look amazing. I love love love french dips so these are perfect for me. Thank you! Ooo, these would be great for a Super Bowl party! Something different than the same ol’ rotel dip and chips. My grocery store deli was out of roast beef so I used Oscar Meyer Delifresh French Dip Flavored Roast Beef. It turned out really good! I also used Fat free Moz. cheese….. I am going to make these again and again!! Amanda – let me know what you think! Lisa – they’d be perfect for the Super Bowl. Great idea! Krista – So glad they turned out great! Vicki – it’s always nice to hear the whole family liked them. Happy to hear they were a hit! Great idea! I made this tonight but gave it a Beef on Weck twist. I swapped horseradish for the cheese, then sprinkled the top with kosher salt and caraway seeds for “Beef on Wonton”. I have sort of a dumb question… I just made these and they tasted really salty. I am thinking it was the Au Jus I used (I couldn’t find the exact type you were talking about) and I’m pretty sure it was concentrate. Should I have diluted it before putting it in the mixture? It’s really impossible for me to say since we didn’t use the same brand and I’m not familiar with whichever one you did use. The only advice I can really give is to try diluting it next time or to try a different brand. Sorry I can’t offer more help! No problem! Do you use the brand you buy straight from the jar? I will just look for that one next time 🙂 Love your recipes. Wow, Kayla, I just logged on to make the same comment/ask the same question. I used the packet of au jus, and instead of mixing the whole packet, I tried mixing just a little bit with water. I’m guessing that’s why mine came out saltier than I expected as well. Next time (for there will be a next time–even salty, these were yummy!) I’ll add more water to the au jus mix or buy the jarred stuff. Can’t wait to try more “cupcake” recipes from Emily’s site! I had the same issue tonight- I made the au jus from the packet because they didn’t have the kind in the jar at the store. I made the whole package and from the small amount I used they did taste super salty. They were still awesome though… I will definitely make these a lot, although I’ll be hunting for the jarred gravy for in the future. Thanks Emily! I made these for dinner last night and they were really yummy! Thanks for sharing the recipe! Made these for lunch today. We used laughing cow garlic herb cheese wedges, because our store was out of swiss. Was SIMPLY AMAZING!!! Just found your blog today and I am a huge fan already. All the foods we love but healthier versions and easy to make as well. Thank you, thank you!! Thanks TiAnna!! So glad you found my blog and that the “cupcakes” were a big hit! I made these today for dinner and they were absolutely amazing. I had 2 and they were filling. Maybe next time I’ll add a little bit of horseradish! Yum, sounds delish! Happy to hear you loved them! Emily…I have recently found your website and LOVE, LOVE, LOVE it. My husband and I both need to lose at least 100 lbs/ea and we struggle with dieting (struggle is not the word). So far we have made 2 of your recipes….the french dip and the meatloaf cupcakes and they were AMAZING! It makes dieting feel like we aren’t dieting at all. I can’t wait to try the tamale bake as it sounds like a dish I would take on a deserted island if I could only take 1 meal. THANK YOU, THANK YOU, THANK YOU for posting these wonderful recipes. Because of your inspiration with the wonton wrappers tonight I am going to do my own little twist and make cupcake eggrolls. Hope they come out as good as your recipes. PS – I think egg roll ingredients would be naturally fabulous as a wonton cupcake! I am sure they’ll be delicious. Let me know! Thanks Emily. I did try the Chicken Tamale bake this week and it was wonderful! I actually brought leftovers for lunch today and am really looking forward to noon. I also wanted to let you know I did do “cupcake eggrolls” and they were delicious! They are very low in points (I think only 1 pt, 2 with a small amount of sweet and sour sauce). Something I will keep handy for snack time…even though I will say they didn’t reheat as well as they were when fresh. Can’t wait for more recipes = ) Getting my superbowl receipes together from your site as well. Pizza bites and bacon cheese potato bites (can’t remember the exact name of those) but looking forward to both for the big game. THANK YOU SOOOOOOOOOOOOO Much for all the great recipes. Everyone I talk to about WW I let them know about your site!!! I want to make these for dinner this week but not sure what to serve with them. Any ideas? I think some roasted asparagus would be fab with these, but you could also do a salad or some coleslaw. I think any of those would be a great complement! I made “oven fries” with mine. You just take a small to medium potato cut into strips, season with salt, pepper, paprika, and I like a little spice so I add a few red pepper flakes. Then spray a little pam over them and bake around 400 for 20-25 min (turning about 5 min before they are done). I try to add some green beans or a salad to it so I get a few green veggies in. Emily’s suggestion is much more healthy than mine but I like fries with my sandwiches and this is a way to get the best of both worlds if I have the points left. Thanks Kelly! You definitely should, they were delicious and super easy to make. I hope you like them! Follow up: HUGE HUGE hit. She loved them and we’re making more tomorrow. Absolutely love love love your blog!!! Made these last night and plan on eating them again tonight. What do you think would be the best way to reheat? Thanks so much for all the great recipes! I always just microwave mine and I think they turn out great, but you could also always warm them up in the oven on a lower temperature. I made these on Super Bowl Sunday – absolutely delicious!! I made 2 batches because we devoured the first 8 cupcakes in minutes! One question – on both batches, the wontons were not crispy on the bottom and sides, they felt soggy. Any suggestions on how to get them to crisp up? Did I put too much spray on the muffin pan perhaps? I tried to use less spray on the 2nd batch but they still turned out soggy. I want to make them again for dinner tonight, do you think they will stick to the pan if I don’t use any spray at all? Glad they were a hit, Krys! They’re not supposed to get crispy on the bottom and sides, actually. I wouldn’t say mine have ever been “soggy” but the tops of the wontons that stick out of the cups are the only parts that get crispy. I came to your blog via pintrest and I dont even know where to start! I want to make everything I see. I am on a weight loss mission and this is just what I have been looking for. Thank you so much for sharing your recipes with the internet world so I could find you and them! Thanks, Linda! I’m glad you found me. Let me know what you make! Made these last night and we loved them!! So easy to make and really tasty. I thought they were on the salty side but I think if I water down the gravy a little, that would take care of the issue. Keep it up with the great recipes! I made these tonight…awesomesauce!!! 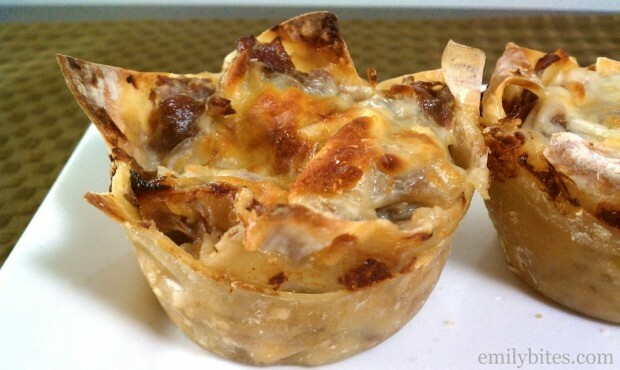 I plan to make the cheeseburger cupacakes this week with the extra wontons! Thank you! And thanks for doing GREAT foor with WW pts! Thanks, Katie!! Happy to hear you loved these. I hope the cheeseburger ones turn out just as good! I’ve made these twice. The frist time I used the jar gravy and they were awesome. The second time I went to a differant grocery store and all they had was the can gravy. I noticed a huge differance in the salt level. I will be stocking up on the jar gravy! Good to know! I’ve only used the jar gravy and they turned out great. Glad you liked them! I made these tonight and they were amazing. I also made the spaghetti cups which I haven’t tried yet and the chicken tamale bake (for the 2nd time). I plan on making the deep dish pizza and another wonton cup recipe tomorrow to hopefully keep us set for dinners for the next week or so! As always, thank you for your blog it has really helped us stick to our WW plan! You’re cooking up a storm, Laura! I love it. Glad these were a hit and I hope everything else is too. Thanks for your comment! Do you mind if I share your recipes on my blog? I have tried a couple and are so yummy!! Glad you’re enjoying the recipes, Brittany! If you do share a recipe from my site you’ll need to include a direct link to the recipe on my blog and be sure to clearly site me as the recipe source. You’ll also need to take your own photos and rewrite the recipe instructions and any ingredient notes in your own words. If you have any questions, shoot me an email at emilybitesblog@gmail.com. Thanks! Everything has been amazing and so filling. I have tried it all except the deep dish pizza casserole which I will probably try tonight. It’s nice having options and they are all filling and reasonable points. My husband has loved everything and says he feels like he is eating too much because they are filling but he is sitll loosing weight. Thank you for all these recipes! I’m so glad you loved them so much! 🙂 Skinnytaste is a great site too. Thanks for the compliment. Enjoy! I made these last night, and they were AMAZING! I think my muffin tin might be slightly smaller than yours (I got enough for 12 cupcakes) and every single one was DELICIOUS! Boyfriend managed to scarf down six, then demand we have these again soon. Thank you! Have you considered a “corned beef and cabbage (or potatoes)” option for St. Patrick’s day? Haha, I am so glad these were such a big hit with you and your boyfriend! I didn’t plan ahead well enough to do any St. Patrick’s Day recipes this year but I did get several requests for them the day before/day of, so next year I will definitely put some together! These are so incredible!!! I will be making these often from now on since my hubby and I are both huge fans of French dip sandwiches and these are so easy to make. I couldn’t find a jar of au jus gravy so I just got a packet mix and only made half of it (still way too much, but I’m going to make these again next week so it’s ok with me!). Do you think that these would hold up on a reheat in the microwave? I was thinking that they would be a good after school snack alternative. What are your thoughts? Emily, I don’t usually post feedback, but I am tonight. I made these, French Dip Cupcakes, for dinner tonight. They were great. I admit I was pleasantly surprised how tasty they were, and how easy it was to prepare. I fixed a salad to go with the “cupcakes” and I feel very satisfied. Thank you for your ideas; I am going to make the Spinach Cupcakes tomorrow. These are awesome!!! I’ve made them twice now and they’re becoming part of my regular dinner rotation! So easy! My only complaint? It’s really hard to stop at just 2!! LOL! Emily, I love that someone “pinned” you on Pinterest! I have been expermenting with wonton’s a lot lately because I found out they were so low in points. I’ve lost 94 pounds on weight watchers so far since September 2011 and I am always in search of healthy recipes that squash those comfort food cravings and it looks like you have covered all the bases for those! Thank you so much for posting these amazing recipes! I made these for dinner tonight and they were OMG soo good! My 7 year old picky eater loved them, so I know they are awesome! I love your site, I cant wait to make more “cupcakes”. Wondering if I could omit the second layer of wonton wrapper to cut the carbs a bit? I had WLS last year and I find breads, pastas, etc. fill me up too quickly – have you had any experience doing just the bottom wonton wrapper and not the middle layer? You may want to reduce the filling if you do it that way. I have done single layer ones, but I did them in a mini muffin tin. Let me know how they turn out! My boyfriend just requested roast beef au jus, and I was trying to figure out a way to lighten it up and then I stumbled onto your blog. Can’t wait to try these! Amazing! These were so good, I could have eaten all of them myself (but I didn’t)! Thanks so much for another great dish!!!! 1st recipe I’ve made of yours and we LOVED it – looking forward to trying many more! PS – Made 8 cupcakes but added some leftover sauteed onions and tri-color peppers to 1/2 of them. Went from a French Dip flavor to Philly Cheese Steak flavor *snaps* just like that! Had one of each for dinner and had to pack them away so I didn’t eat my leftovers! How smart! Wonton wrappers are so versatile! I usually fill my wonton cups with salsa. I’ve got to give this recipe a try. Thank you so much for creating this! just made these and my boys keep telling me how good they are. cant wait to try more recipes!! We made these and the Buffalo Chicken. I normally don’t like french dips but the french dip was the winner! They were delicious. I wish I had only eaten two, but…..
Haha, that’s the tough part. Glad you loved these! I just made these and they were amazing!!!! I can’t get enough of these “cupcakes” recipes!!!! I made this the first time and the kids LOVED them. A while later- I decided my kids needed a life lesson – and a learning experience in the kitchen – so I picked this recipe for them- not a lot of ingredients and easy to assemble with a 7 and 10 year old. They were so excited to make their own dinner and loved it even more because of that. That’s so awesome!! This is a perfect recipe to make with your kids. I bet they felt so accomplished :). Glad to hear these were a big hit! I am planning on making these tonight but I had a question on the gravy. Is the Heinz Gravy actually Au Jus or is it the Beef Gravy. I didnt see it if it is the Au Jus and just wanted to make sure if I needed to check out another store. I found the Au Jus gravy and OMG these are great. Thanks for the great receipe! SO good! I’m excited to make more “cupcake” recipes now! These are great! My husband said they remind him of Philly Cheese Steak Sandwiches. I think I might try sauteing bell peppers and onion & layering them with the rest of the ingredients. Hey Emily, how do I add my picture? Emily – AMAZING! We made these for dinner tonight and even my picky eater liked them! We used Johnny’s Au Jus since our store doesn’t carry Heinz. I pre-cooked the wonton wrappers in the muffin cups to give the edges and bottom a crispy texture. And I only had 1 layer. I will defintely be making these again. Tomorrow night I am trying a Philly Cheesesteak with peppers and onion spin on this recipe. Please keep your cupcake recipes coming! can you freeze the leftover wrappers and defrost and make another receipe? Or how long will they keep there’s lots in a pkg. Emily, once again you’ve outdone yourself! I had these for dinner tonight and they were so good! I actually made them last night for and they reheated really well. Sorry if I missed it, but what size muffin tins are you using? I swear you never cease to amaze me. Made these for dinner tonight and oh my gosh are they delicious!! Made these tonight and they were amazing. Thanks for another great recipe!! Hi, we are in Australia and i can not find Au Jus sauce? What do you suggest to use as a subsitute? These were SO good!! My husband loved them! 🙂 Easy, tastes good, and healthy!! What more could a person ask for?! Thank you for your fabulous recipes. These were delicious. I will definately be making these again! I couldn’t find the au jus sauce either so I tried to think of something similar and I came up with a combination of beef gravy diluted with beef broth. It worked out great and tasted delicious. made these tonight for dinner and they were a hit. I also found them a bit salty (used the same gravy the reciped called for). may cut back on the amount. To me french dip also includes saute onions so I carmelized some onions ahead of time and added them in between the 2 layers instead of the mozzarella and put all the cheese on top. will be trying the hawaiian chicken cupcakes later in the week to use up the rest of the wonton wrappers. I hope this question was not already asked….the bottom layer is a wonton and the middle layer too. Are you topping the cupcake off with a wonton or is the top layer mozz cheese? Just made these tonight – my husband said this was the best new recipe for a while. Definitely going in the keeper list! WOW! made this for my daughter and I for lunch today. It was delicious! Thanks for all these great recipes! Someone told me about your site and this is the first thing I have tried…I have to say that I will be trying many more or your things cuase these were great. Very delicious. Cant wait to try out more of your receipes. I also couldn’t find the Heinz Au Jus in the jar. I instead made the seasoning packet of au jus, but added extra water to cut the salt and added flour to thicken it up. Worked like a charm! These were delicious.. will definitely make them again. Thanks Emily! I made these last night and my fiance went nuts! He first warned me not to feel bad if he doesn’t like them because he has such picky taste when it comes to anything with roast beef and only likes Arby’s roast beef. Well once he tried one of these cupcakes- he ate 3 of them and was in complete awe of how amazing they were! I’m like super woman now for cooking them! THANK YOU! I have a question about the points – you wrote 4 oz/1 cup.. but 1 cup is 8 oz. Which are the points for? 1 cup of cheese = 4 oz by weight. You are talking about volume ounces which is not what cheese is measured by. Either weight out 4 oz or measure out 1 cup. Hope that helps! I just found your site and am excited to try your recipes – they look great! Just a quick silly question… Do you tend to eat these by themselves or do you serve it with a side? I’m always having problems trying to figure out what to serve along side these type of dishes for a healthy well balanced meal. regular or mini muffin tin ? Made these last week with Boar’s Head London Broil Roast Beef (did not affect PP Value). Made with a chopped salad on the side. Wow, they are delicious! My whole family loved them – which rarely happens! 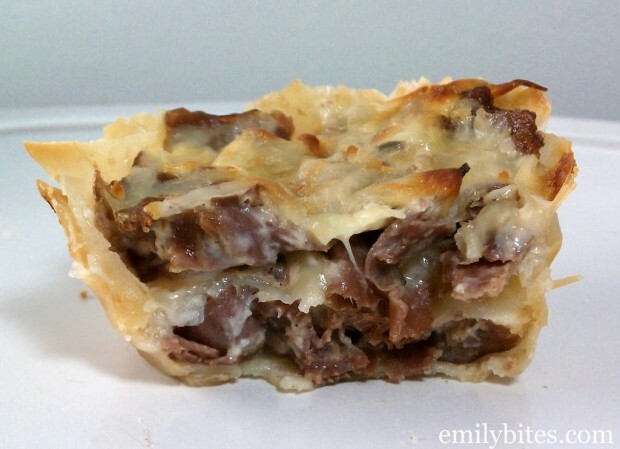 I am SUPER excited to make these and I don’t even like roast beef! As I drooled over the picture, I thought some onions might also be a yummy addition to mix in with the meat! Made these last week and they were amazing! Will be making again – this time will try the meat mixture on a roll for a “gotta get to softball training by 6 pm” meal. Can any or all of your “muffin” recipes be frozen? Any suggestions on how to do that? I was a little hesitant as I was microwaving everything together, but just as the other reviewers commented, these were delicious! I used the leftover wonton wrappers the next day and substituted the roast beef for ham, the mozzarella for sharp cheddar and the Au jus for melted butter and brown sugar, and they were so delicious that my boyfriend ate nine in one sitting (I could only eat two bc they were so rich!). This is the fourth or fifth recipe of yours I’ve tried and they’ve all been great! I made them, did like them but too much dough well Emily realized why w.a.i.t for it….duh i bought EGGROLL WRAPERS not wonton wrappers haha. Will try again thats why i felt i need ed to cut them down etc. jeeezzzzz. Wow! What a hit! Thumbs up from the hubby, 7 & 5 years olds. Not only was is easy – but they turned out looking just like the ones in the picture – and that NEVER happens. 😉 I used the garlic herb Laughing Cow cheese as someone mentioned in another reply and it was super yummy. I also always have a supply of pre-sauteed mushrooms, red peppers, onions, garlic and fresh herbs (like oregano or basil) in the fridge to enhance eggs or other dishes throughout the week. (I just make a big batch on Sunday and it keeps in fridge all week). It has 0 points and i added a little scoop to the middle of my cupcakes and it really added something special. I have been instructed by the family that we need to have “cupcakes” for dinner at least twice a week now. These were super super yummy. My husband NEVER comments that something is good and from the first bite he got this surprised look on his face and said “wow, these are really good!”. I am super excited that I found your site and am planning a girls weekend at our cabin featuring several of your recipes. Can hardly wait. Have already shared links to your site with my sister and oldest daughter. You can bet these little powerful cupcakes will be gracing their table soon as well. My store didn’t have the Heinz Au Jus so I used Knorr Au Jus Gravy mix in the packet. I had to cook it in water on the stove but it worked great. Not too salty either. Hi Emily. I just recently found you and I love your recipes. I made these last night and loved them. I was thinking a fun variation would be to add sauted peppers and onions and it would be philly cheesesteak cupcakes. Thanks again for your awesome recipes! I made these cupcakes last night and the whole family loved them – even my very picky 11-year-old son. Thank you for the awesome recipe. It’s definitely a keeper! I made these tonight and my husband devoured them .. even said they were restaurant quality! What a hit! I made these for dinner tonight, and my entire family loved them! Your recipes are the best–they make weight loss almost, dare I say it, fun! Haha. Made these tonight to take to work next week for lunches. Had to have one just to see how it tasted :).. they were good. I did find them a bit salty but that may be because I used a home made Au Jus gravy recipe which was a bit salty as well. I’ve made several of your other cupcakes and they are all so delicious! Thanks for another great recipe… might even try this using ham too!! Emily…you have out done yourself once again. These were AMAZING!! My husband just ooohhh’d and aaahhhh’d over them and said that they tasted like something from his childhood! This is the 3rd recipe this week that we have had of yours and all I can say is…keep doing what you are doing, because you not only are helping me with my weight loss, but many others! Thanks again!! I made these last night. They are AMAZING. I made them exactly how it says. The only difference is I used packet Au Jus. After reading all the comments, I only used 1 tea of the powder with 1/2 cup of water. It didn’t turn out salty at all. It was perfect. This is my favorite recipe that I’ve tried on here. Super quick and easy. LOVE these! I’ve make them three times. The first two with au jus that wasn’t Heinz. (I’d looked all over for the Heinz, but couldn’t find it anywhere.) The third time, I’d ordered the Heinz au jus from Amazon and I played with the recipe by adding onions, mushrooms and using cheddar instead of the mozzarella. I made these last night and they are incredible!!!! I couldn’t find the jarred gravy, so bought the packet and only made 1c worth of it. My husband and kids used the extra to pour over top of their muffins! My boys didn’t like the wrappers, but that didn’t surprise me — they did, however, devour the filling, so that was fine with me!! Thanks for your recipes – they are the best! Love this site! One question. Is it one or two wontons per muffin cup. Does this make 8 or 16? They’re in the FAQs under the “about” tab above! Double batch going in the oven now, love these!!! Our usual French dip is made using a whole loaf of French bread, nice to lighten the carbs but keep the flavor! This is so awesome, I can’t wait to try this next week in an attempt to get my nephew to eat something other than Mac n Cheese. One thing, though. Don’t buy food marketed as low fat, or fat-free. It if often less enjoyable, as far as flavor is concerned, and it is of no benefit to losing weight or staying in shape. It’s nothing more than a marketing gimmick. I made these the other night. They were delish! I added carmelized onions to my husband’s and instead of trying to layer them, I put the filling into an eggroll wrapper, rolled, sealed and baked. Then cut them in half and dipped into a little extra au jus. Thank you so much for a great recipe. Can these be frozen and thawed? I fixed these last night and they were very good. I heated the leftovers up for lunch today and they were even better the second day! Great surprise for a dull work day. Next time, I’m going to add onions and bell peppers… mix it up into a Philly French Dip Cheese Steak Cupcake! Oh yea! These were DELICIOUS!!! I made for some friends last night and EVERYONE loved them. What did you serve this with? I think I would need 2. I have problems matching entrees with sides without having a 14 point meal(by the time you add in a cup of skim milk). How many of these are a serving? I made these for a second time, the first time, they were really salty. This time, i made my own Au Jus and it worked out perfectly! I served on top of a bed of peppers, onions and mushrooms that i sauted in the remaining au jus. I also put pickled banana peppers on top of each cupcake before baking. These look so yummy. Can’t wait to try them! Question: Do you use just one wonton wrapper in a regular sized muffin tin? Mine never seem to fit and ‘look’ right. 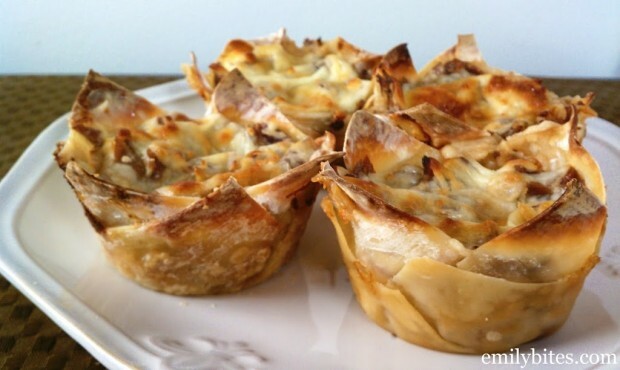 If ya know what I mean… I’ve used the mini muffin tins and the square wonton wrappers work great in those! Suggestions? I used leftover roast beef. YUM! !